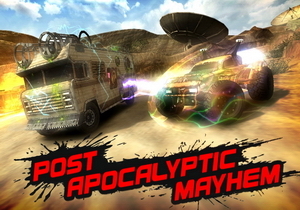 Post Apocalyptic Mayhem lets you race and battle heavily-modified vehicles through numerous breathtaking tracks and lay waste to other racers in over-the-top vehicular mayhem. You can use special vehicle abilities to cause spectacular destruction to enemy cars as you fight and speed to victory. Youll experience remarkable speeds, hilarious and violent weapons, reinforced vehicles and various exhilarating tracks. Vehicles  PAM offers numerous post apocalyptic vehicles. All the Vehicles are heavily-modified and extremely menacing. All Vehicles are heavy-duty, reinforced and are able to take and give a lot abuse. The vehicles all look like they can quickly and easily travel over the newly scorched wasteland while effortlessly smashing other vehicle along the way. Weapons  All of the vehicles have three unique and powerful abilities that they can use to severely damage opposition vehicles: one front attack, a side attack and a rear attack. A Player can receive these special abilities by picking up Special Ability Barrels that are placed throughout all of the tracks. When a vehicle runs over a Special Ability Barrel, the vehicle will gain that specific ability and the Player will be able to use it whenever they prefer. Multiplayer  Intense Online Multiplayer racing for up to 6 players. Achievements  35 Steam achievements to be earned and displayed proudly. Online Leader Boards  Every kill, every race and every result will be recorded and uploaded to online leader boards for bragging rights and fueled competition.